Maharaja— the mere mention of the word brings to mind images of colorfully decorated elephants and turbaned Indian Kings be-jeweled in diamonds, emeralds, gold, rubies, brocades and layers of pearls. The translation of Maharaja, from its Sanskrit root, is ‘king of kings’ and ‘great king’. The title, Maharaja, appropriately denotes immense wealth and power. 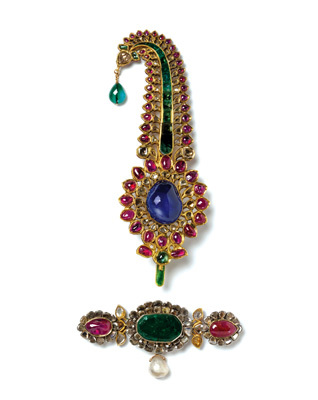 This extraordinary exhibit represents luxurious items from the Indian Courts during the time period 1700-1940, a time of vast political, social and cultural changes. An overwhelming collection of jewels, textiles, weapons, gold and silver, crystal, furniture, paintings and so much more are on display. Upon entering the first room, the beauty of the large Sarpech struck me; a jeweled ornament is the crown for the Prince’s turban. Designed in the motif of a peacock feather, the organic shaped sizeable sapphire in the center is flawlessly vibrant blue. The large white pearl, subtle, yet, so rare—found by a diver in the Persian Gulf, is valuable and most prized of all. Enhanced by the colorful rubies, emeralds and crystal diamonds the flow of the jewel is whimsical as it ends with a large dangling emerald. One can just imagine the emerald jiggling side to side as the Prince spoke of important political engagements. Decorated from head to foot, the Maharaja commanded dignity and respect from all his observers. Worn in the mid-19th century this Jaipur style belt is pure luxury fabricated in diamonds, pearls, enamel, gold and silk. Enormously round diamonds surrounded by natural pearls is blindingly white and modern in its traditional antiquity style. For the Princesses, the transparent silk saris and delicate jewels were unsurpassed in creating a sensual and feminine style, typical of Benares. The 19th century, delicate pair of gold Makar kara, bracelets, with heads of a mythical sea creature, is enameled in pastel colors of pink, blue and green. Large diamonds are on three sides of the bangle, creating an iridescent glow. 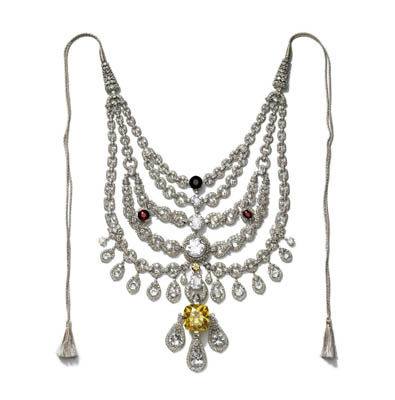 In 1928 Paris, France, the Maharaja Bhupinder Singh of Patiala commissioned Cartier Jewelers to create this magnificent five-stranded diamond necklace with the large yellow diamond pendant drop. 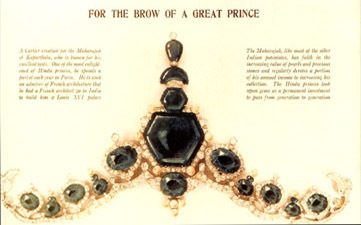 Traveling to Paris, with his crown jewels secured in a locked trunk, the Maharaja desired to have the precious diamonds revamped into a ‘modern’ Western style. The luxurious ceremonial necklace was designed in a refined and sophisticated fashion, using hundreds of diamonds, from incredibly large to small. Many photos have been taken of the Maharaja wearing his impressive layers of diamonds. On exhibit, the yellow diamond is replaced with a yellow zirconia, the large round centered diamond is replaced with a white zirconia, synthetic red rubies replace the natural rubies and quartz stones replaces the natural yellow diamonds, the brown stone is topaz. In spite of the substitutions, the splendor of the necklace is not diminished. To this day, in quantitative terms, the largest single commission that Cartier has ever executed—has been from the Maharajas.